Jones has founded and led numerous social enterprises engaged in social and environmental justice. *Rebuild The Dream, a 21st Century “think tank” that champions innovative solutions to fix the U.S. economy and uplift the next generation. Jones has been honored with numerous awards and spotlighted on several lists of high achievers, including: the World Economic Forum’s “Young Global Leader” designation; Rolling Stone”s 2012 “12 Leaders Who Get Things Done”; TIME’s 2009 “100 Most Influential People in The World”; and the Root’s 2014 “The Root 100.” He is presently a fellow at the MIT Media Lab. The USA has only five percent of the world's population. Yet we produce: (a) about 25 percent of its greenhouse gasses and (b) about 25 percent of its prisoners. Coincidence? Van Jones doesn't think so. He sees "mass incarceration" and the "mass extinction" as twin outcomes of the same false ideology: disposability. Industrial society behaves as if we have a throwaway planet - and throwaway people, too. To reverse course, Van says we must shrink the prison system and grow the green economy. Imagine a new economy, where the founding principle of our country- liberty and justice for all-is deeply rooted in our economic philosophy and design, where businesses can profit alongside flourishing communities. The next American economy must value production over consumption, savings over credit and ecological restoration over ecological destruction. To achieve sustained prosperity, we need to transform our ideas and understanding around ownership and wealth-transcending consumerism, transforming corporations, and revitalizing communities. Civil rights attorney and TV personality Van Jones seeks peaceful streets through approaches that are smarter, fairer and less costly. His organization, Dream Corps Unlimited, houses the Beyond Prisons campaign. That initiative works to safely and smartly reduce the prison population by at least 50 percent - by promoting proven, bipartisan solutions. Neither Democrats nor Republicans see much sense in locking people away for long periods of time, often for petty offenses, and then denying them a chance to work, vote, rent an apartment or get a student loan for the rest of their lives. 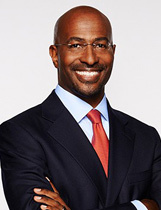 Former Obama advisor and CNN personality Van Jones created #YesWeCode to find real solutions. Housed at Dream Corps Unlimited, #YesWeCode is working to help 100,000 young adults of color – both women and men - find employment in the technology sector. Learn from the many insights that Van has gleaned by working directly with dozens of major tech firms, the Obama White House, and the nation's top accelerated training programs. Hear how cultural barriers - on both sides of the divide – may be the biggest obstacles to an inclusive tech sector. "Green For All": Can Environmentalism Include Everyone? The solar industry is booming. The fight for climate solutions is accelerating. The movement for a greener future is regaining steam. But will this renewed "green wave" lift ALL boats? Or will some places enjoy clean energy, green jobs and organic food, while others fall further behind? How can we avoid "ecological apartheid"? Van Jones has answers. He was the primary advocate for the Green Jobs Act of 2007. He is the founder of Green For All, a national organization working to grow the green economy in communities of color. He wrote the bestseller, The Green-Collar Economy - the definitive book on green jobs. And he was the special advisor on green jobs and innovation to the Obama White House. Van has unique insight into America's turbulent political scene. He has worked closely with political players at all levels - and across the spectrum. On the left, he has been allied with everyone from Richard Branson to Black Lives Matter. On the right, he has campaigned to win criminal justice reform alongside Newt Gingrich and Koch Industries. George W. Bush signed his first legislative proposal, the Green Jobs Act. Then President Obama appointed him to be special advisor on green jobs. Most recently, Van was "on the ground" in Ferguson, Charleston and Selma (for the 50th anniversary of the historic civil rights march there). Now revised and updated, Van Jones's provocative and cutting edge New York Times bestseller The Green Collar Economy delivers a viable plan for solving the two biggest issues facing the country today-the economy and the environment. In Rebuild the Dream, green economy pioneer Van Jones reflects on his journey from grassroots outsider to White House insider. For the first time, he shares intimate details of his time in government - and reveals why he chose to resign his post as a special advisor to the Obama White House.